Since the world is going advanced it is getting creative too. Be it weddings, birthdays, baby shower party or some other event, people are becoming more specific about their invitations. They try to make the invitation more creative, engaging and uplifting. So that the receiver gets awestruck. Amidst so many ideas, one that is sweeping the world is of bottle invitations. No matter how majestic the Luau wedding decorations are going to be or how beautiful, will be the venue. What if the guests you have invited do not turn up? It is not an easy task to entice, your guests to, attend your party. You have to be innovational in your ways of inviting. Only then the guests are bound to come. When you send a bottle invitation for your occasion, you do something unconventional to leave an impact on the receiver. What is the point, if you are dropping a simple, square card with some wordings on it? The gratification is in inducing mind and heart of the receiver. For example, if there is going to be a destination wedding invitation for guests. You can be as creative as you want, in your bottle invitation. What you can do is, picking a decorative bottle, putting in different slips, telling about dress code, venues, snacks, etc. When you unroll the entire schedule through different leaves, passionately placed in the bottle; it looks absolutely heart winning. 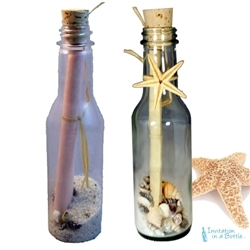 Once you send an invitation in a bottle, it not only looks fresh but stylish too. When the receiver gets your invitation, he or she becomes more curious about the final day. Certainly, if you receive an invitation that is beautifully wrapped in a bottle. You are going to be excited about the celebrations. You will want to know what specific arrangements or type of, wedding it is going to be. Surely, the bottle invitation has already sowed a seed of eagerness in you! You can match up the bottle invitations with the decoration of the event too. Like, if you are planning to brighten up the Luau wedding decorations, you can match up the design and style of the bottle invitation, with that finery. That will give you a complete feeling. Moreover, if there is any theme of the event, you may go ahead and introduce it in the invitation itself. So, go unorthodox with your innovative bottle invitations, along with gorgeous Luau wedding decorations.